How to Put your Blogger Site on Maintenance Mode You might have seen sites which show a message that “Our site is in Maintenance mode, please try accessing later”. Many popular site uses maintenance mode when they are going through a monthly maintenance check or improvising site experience because nobody likes to land on a page that is either broken or no longer reachable. in other sense, new websites often use it as coming soon page allowing users to sign up to be notified when site is ready for launch. 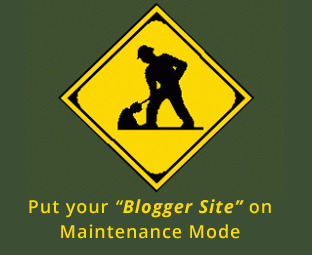 In this article, we will show you how to put your blogger site on maintenance mode. You might have seen sites which show a message that “Our site is in Maintenance mode, please try accessing later”. Many popular site uses maintenance mode when they are going through a monthly maintenance check or improvising site experience because nobody likes to land on a page that is either broken or no longer reachable. in other sense, new websites often use it as coming soon page allowing users to sign up to be notified when site is ready for launch. In this article, we will show you how to put your blogger site on maintenance mode. First thing you need to do is to download Soonex – Maintenance mode template. Since, you are putting your site on Maintenance mode so be sure to take a backup of your existing template. Now upload the template to your blogger site. After uploading the, you need to go to Blogger >> Layout >> to configure the template. This template setting is divided into three different sections i.e. tabs, first one is home, second is about and third is contact. Soonex allows you to create beautiful pages to provide improved user experience. 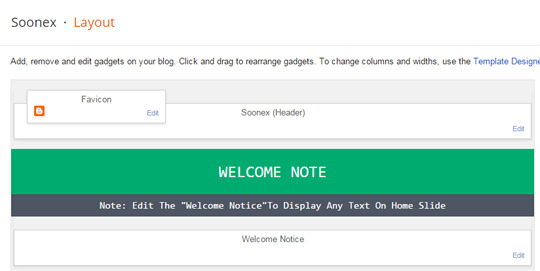 The first option is of “Welcome Note” that you’ll find in the Layout area on blogger dashboard. To customize press the “Edit” link and input the description which you want to display on your site, weather your site is on maintenance mode or you are about to launch a new site. Once you’re done writing it, press “Save” button to store the changes you made to the template. Soonex also allows you to add a subscription widget from which users can subscribe to your feeds and can also receive notification when your site goes live again. To customize, go to “Email Subscription” and press the “Edit” link. Now input the username of your feed (Example feeds.feedburner.com/mybloggerlab, here mybloggerlab is the username). Once you are done with adding the username, press “Save button. If you are creating a coming soon page, or you would like to display a accurate time to your users when your site will be up, then scroll down to "Countdown Settings" and press “Edit” link. Now enter the time and date of the countdown in this format 2014/10/15 12:00:00. However, If you don’t want to display the countdown widget then simply leave the text area blank or input “empty” in the text area and press “Save” button to store the changes. You can also add information about your site. Go to “About The Company” and press “Edit” link. Now in the text, insert the information you would like to display on about tab. Once you’re done press “Save” to store the changes. We hope this article would help you in creating a powerful under maintenance or coming soon page for your blogger site. Have you ever used a maintenance page on your site, if yes feel free to share your knowledge in the comments below. If you like this article then, share it on Twitter, Facebook and Google+.